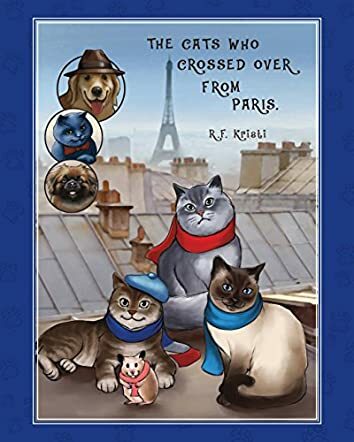 The Cats Who Crossed Over From Paris: Inca Cat Series Book 1 by R.F. Kristi is the adorable story of Inca the Siberian cat and her furry family. The family consists of her brother, Fromage, who loves cheese, and her sister, Cara. They move to London as their human, Missy, who owns a cheese shop in Paris, is moving to the new place. In London they meet Monk, a blue Russian cat, and Terrance, a golden retriever, who are both living in their neighbor’s house. They also meet Solo, the detective who lives in the same compound. Their stay in London becomes exciting when Monk tries to help Polo, the Pekingese, whose owner, Senora, has her diamond necklace stolen. Senora is already stressed as her husband, Raoul, has been lost on Mount Everest. Will Inca and her furry family, along with Monk and Polo, be able to find the missing diamond necklace valued at one million pounds? It is a fun read and purrfect for all cat and animal lovers. All the characters in the storybook are well sketched, relatable, and memorable. The illustrations are bright and lively and breathe life and movement into the scenes and characters. The detailed and descriptive narration makes the scenes and the characters vivid and real. The book is an excellent bedtime story book and can also be used for read aloud sessions in classrooms and school libraries. The furry family of Inca is charming and lovable, and kids will love reading their adventures.